In discussions and debates about the Zelda series, typically the word “race” is used to describe all the different tribes, species, and creatures who seem to act with human intelligence. The Hylians, the Gorons, the Zora, the Deku, the Gerudo, and many more fall under this term. Among them are the many “human races” or traditional races or breeds of human, such as the Hylians, the Gerudo, the Sheikah, and more traditional humans like the Ordonians. Before Ocarina of Time, there was little to no importance placed on the non-human races. You had the Hylians and nothing else. The Zora were one race that appeared as early as the first game, but as monsters, not an intelligent and civilized culture. They were implied to have some intelligence in A Link to the Past, when King Zora presented Link with the Zora’s Flippers, but he is the only Zora who talks. The rest are just enemies, and aside from this one interaction they play no part in the story. It’s interesting that the Hylians went from being the only race to being only one out of many important races. Their role has been severely downplayed more and more as new games have come out (especially so in Twilight Princess because of the Oocca). At the same time, ever since it introduced some series staples like the Zora and Gorons, Nintendo has almost refused to drop them. Is this wise? It wasn’t until Ocarina of Time that there was any major expansion on the races of the series. It was in this game that the Zora were redesigned and expanded into a civilized race with its own culture. The mountain-dwelling Gorons were also invented, as were the Kokiri and the Deku of the forest. (The Deku wouldn’t become that prominent until Majora’s Mask, but they still played a role as a race in Ocarina of Time because of how many talked and/or operated shops). Finally, the game also introduced several new races of human, such as the Gerudo and the Sheikah. The term “human” itself was never used in Ocarina of Time nor in any games prior, but it would be seen later in the series. 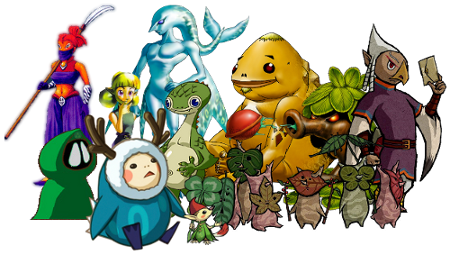 Subsequent games have added new races, such as the Tokay, Subrosians, Rito, Koroks, Twili, Yeti, Oocca, and Anouki, but the ones in Ocarina of Time seem to be the most ingrained in Zelda lore. The Sheikah and the Deku have been referenced more rarely, and the Kokiri were dropped almost entirely, but the Gorons and Zora have reappeared over and over again ever since Ocarina of Time. In a series that started with only the human Hylians, is it necessary for Nintendo to decide that these two races MUST be in so many games? Their absence didn’t detract from the experience of playing the original four Zelda games, and while it arguably was a major part of Ocarina of Time, that doesn’t mean it has to be a pivotal aspect of the Zelda world. After Ocarina of Time, we saw a lot of side games. There was Majora’s Mask, which was a side-story taking place in a parallel version of Hyrule, so of course it had the same races. Oracle of Ages and Oracle of Seasons came out on the GameBoy Color, and while they featured many of the same races, that was likely because they drew a lot of characters straight out of Ocarina of Time and Majora’s Mask, and they didn’t limit themselves to Ocarina’s races; the Tokay and Subrosians made their only appearance in these games. In short, both Majora’s Mask and the Oracle games re-used the races of Ocarina of Time, but they had particular reasons for doing so. 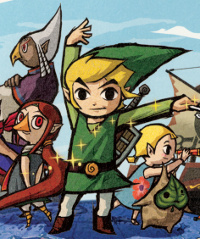 The next major release in the series was The Wind Waker, in which all of Ocarina’s races were dropped from the main lineup. The Zora and Kokiri evolved into the new races, the Rito and Koroks respectively, and only three Gorons appear, with no indication that their civilization thrives anywhere else. The Sheikah are only vaguely referenced, and only one Gerudo, Ganondorf, appears in the game. The Wind Waker had arguably some of the series’ best storytelling and dramatic scenes, so clearly the absence of these races wasn’t a drawback in any way. The only other references to the Zora or the Gorons until Twilight Princess came in the form of the Gorons’ minor appearance in The Minish Cap. Twilight Princess was the next major console release to use both races again, and the Gorons proceeded to appear in both Phantom Hourglass and Spirit Tracks. The Zora, however, have been noticeably less prominent. This is probably because of a combination of two things. One, compelling water-based regions have been scarce and two, all of the Zelda games on the DS are based on The Wind Waker’s world, in which the Zora have evolved into the Rito (despite the Rito also being absent from any game except The Wind Waker, which is ironic). These races have seen frequent use by this point, especially the Gorons, and both have become fan favorites. Is either race superior to the other creatures introduced in the series? Clearly some may favor them, but they aren’t any better from an objective game design or storytelling perspective. 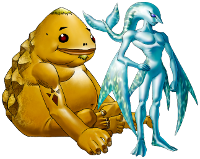 I think that, despite how interesting the Gorons and Zora are, it is not completely necessary to have one or both appear in every game, and to be fair, Nintendo has already done otherwise to some degree. The very next major Zelda game in the timeline after Ocarina of Time had an entirely new assortment of races, and even the Oracle games created several new ones. But after The Wind Waker, it seems like Nintendo has begun to go back and re-use these races more and more. Nintendo should relax on using them and allow games consisting of completely new races so they can focus on unique design and creating a new world populated by unique creatures, whether that world is simply a new version of Hyrule or something else. Seeing a game where Nintendo focuses on creating an entirely new place or face for an existing place would be interesting, and I think our chances of seeing new things like this are lessened by acting like we must always keep the same races. This would apply even if the Gorons and Zora were not the races being re-used. This does not mean we can’t see them again from time to time, but we should still see games without them on occasion, if for nothing but the sake of variety. Also, without other races, the fantastic elements of the series that make the world of Hyrule an intriguing place are somewhat diminished. Still, there are many things you can do when you do not have a race that is perfectly suited to one type of extreme environment. What if instead of the Gorons with their super strength and heat-resistant bodies, or the flying Rito, we have mountain-dwelling humans (perhaps even a new human race, but still just humans), who navigate the treacherous mountains and cliffs with grappling hooks and other means. Perhaps these humans are trapped in the mountain, or perhaps they are a barbaric mountain tribe? There are many things that you can do with human races or that aren’t possible when you only have fantastic races that are perfectly suited and adapted to a special environment. Zelda has a lot of races and a few especially beloved ones, but none of the existing races except perhaps the Hylians are crucial to the series’ identity or its nature. Nintendo should feel free to experiment more and be more creative, and I think fans should embrace this. All the Zelda games have always had unique identities, often having their own atmosphere and style. There is no reason that these differences shouldn’t extend as far as the creatures that inhabit the game’s world, because that’s how it’s always been. Zelda is about adventuring through interesting and fantastic worlds, so all of the worlds should be populated by different assortments of creatures!